"This was the first pie I ever made, and I put together the recipe from other pie recipes I found, and my own mother's input to make this recipe my own." Divide the pie pastry in half; roll out half into a circle on a floured work surface, and line a 9-inch pie dish with bottom crust. Roll the remaining half out into a 10-inch circle on a floured work surface, and set aside. This is a really good recipe. The only thing I did was cut the cinnamon and allspice down a bit. I felt that using 1 whole teaspoon of allspice overwhelmed the fruit flavors in this pie. 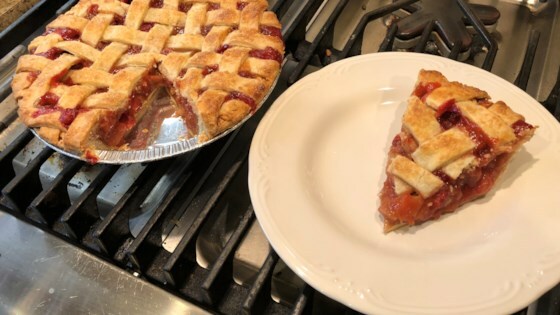 This is the best strawberry rhubarb pie recipe I have ever used. It is absolutely delicious. I added 1 cup red Rasberry's.